It’s asparagus season! Spring is officially here which means seasonal vegetables are starting to appear in our menus and produce sections. The first of the spring veg to make its debut is asparagus. You can start seeing fresh asparagus as early as February with its peak season in April. There are so many deliciously different ways to enjoy this magical stalk and yet not enough wines to complement its green goddess goodness. Bzzzz! Wrong answer! We love asparagus too much for that kind of negativity. We’ve done the due diligence on this long-standing belief, so you don’t have to. We share some lovely pairings that debunk the reputation of asparagus as “the enemy of wine” and a stunning and easy peasy to prepare Spring Asparagus Gruyere Tart recipe. ∙ Asparagus has hangover-fighting enzymes. (As if we needed another reason to pair some good wine with this delicious sprout). ∙ Asparagus has been hailed a miracle healing herb dating back to ancient times. ∙ There are three different varieties of asparagus: green, white, and purple. They all have slightly different flavours. The white can sometimes taste similar to an artichoke heart. ∙ Asparagus takes approximately three years from seed to harvest. ∙ Asparagus is high in antioxidants, which helps to fight the ageing process. 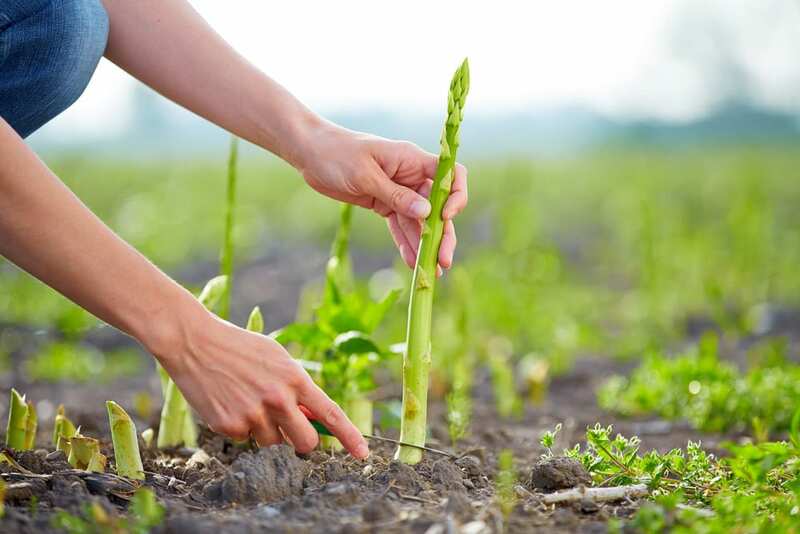 ∙ Asparagus is a rich source of vitamins and minerals, and as part of a healthy diet may reduce the risk of cancer and cardiovascular-related diseases. ∙ Asparagus has no fat, contains no cholesterol, and is low in sodium – Mangia, Mangia! Why is Asparagus a Wine Pairing Challenge? Asparagus has a bad rap for being notoriously tough to pair with wine, and there is some science to back that up. A member of the lily family, asparagus contains the sulfurous amino acid methionine. This compound is in part responsible for the infamous “asparagus pee” (you know what we’re talking about). Most importantly, this compound together with the grassy flavours of asparagus are the culprits for making a wine taste metallic or vegetal. However, when you crave that asparagus umami fix, and you love wine – you find a solution. The general rule is the rawer your asparagus; the more difficult it is to pair. If “naked asparagus” is your thing, the usual go-to has been a crispy, light, floral Sauvignon Blanc. 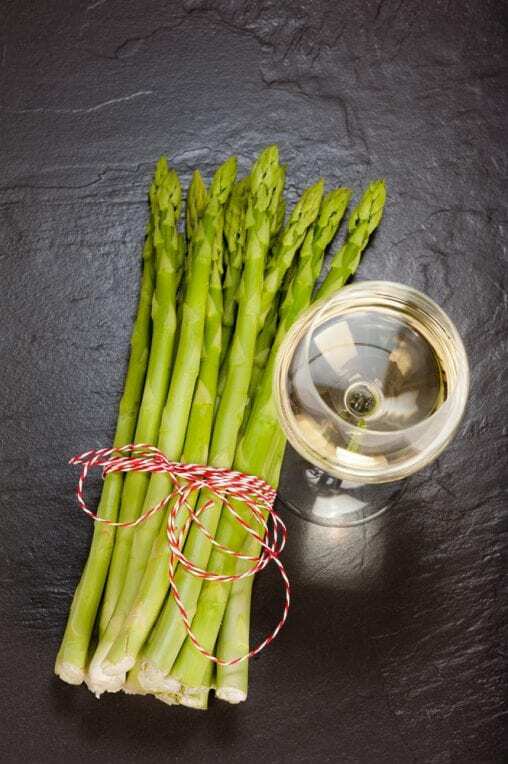 The refreshingly light green flavour of a Sauvignon Blanc helps to complement and not clash with asparagus. Wines to avoid include heavily oaked chardonnays and high tannin reds. ∙ Serve asparagus with a creamy dressing or smother in Hollandaise sauce. The creaminess of the sauce adds richness and body. Bender Paulessen is a dry Riesling with a delicate mineral edge. The bracing acidity will cut through the sauce and marry perfectly with the classic German dish. ∙ Grill the asparagus to create a char to take that bitter edge off the green. (We recommend lightly steaming the asparagus first). Alkoomi Chardonnay is fresh and ripe with flavours of peach and melon. It is not too dry, as it spends only a very short period of time in the barrel which gives it a bit of creamy texture, pairing nicely with a smokey char. ∙ Saute with a bit of pancetta or bacon to add salt and a meaty body to the asparagus. This combination of ingredients allows you to pair the dish with a bit of red. Guerinda Tres Partes Tinto Roble is a silky smooth Spanish Garnacha with well-integrated tannins that make it work with this preparation. Herbs and violets on the nose lead to a beautiful spice and voluptuous red fruits. 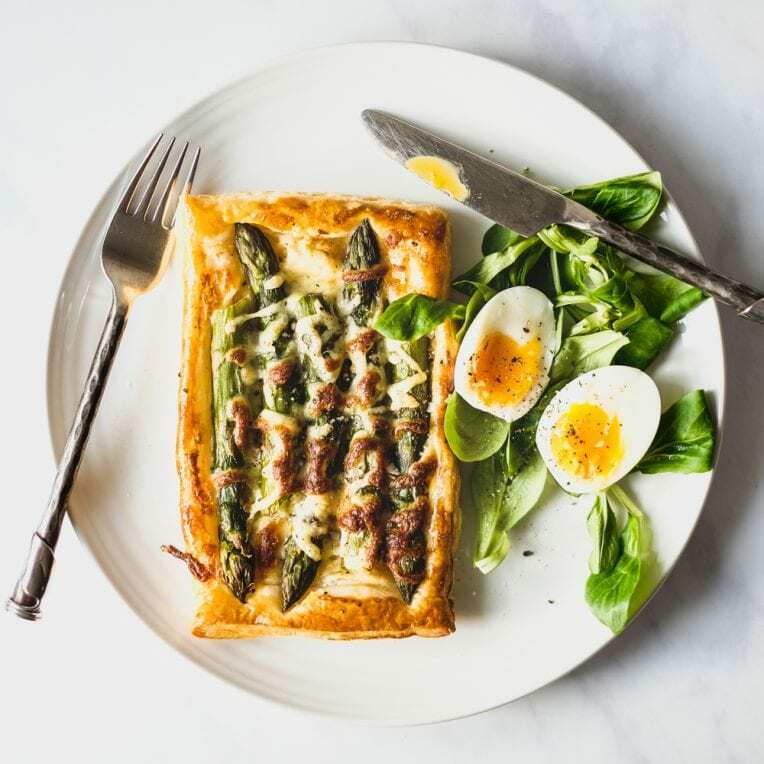 Spring Asparagus Gruyere Tart is sure to go down a treat for any spring or Easter brunch. It is a show-stopping dish, especially when made with plump, in-season asparagus. As visually appealing as it looks, it is as simple to create. You can’t get much better for a melting cheese than Gruyere. The salty, nutty flavour adds more taste and creaminess yet remains a background player to the other ingredients. It all goes so splendidly with the buttery pastry and asparagus. If you can’t find Gruyere – Fontina, Gouda, or Emmentaler can be substituted. A weighty but fresh Beaujolais Blanc pairs beautifully with this spring tart. Jean Paul Brun’s Domaine des Terres Dorees ‘Classe’ is a dry, lovely intense ripe fruit with citrus flavours. Pure, juicy and succulent. One of many Vegan–friendly white wines available from Wines Direct. If you want to turn up your occasion a notch or two (or three), pair your tart with some bubbles. Jackie Blot ‘Triple Zero’ is a real class pairing. A naturally-made sparkling Chenin Blanc with unsurpassed elegance, purity, and expression of fresh, soft citrus, and pear flavours. Preheat oven to 200°C, 180°C Fan. Thaw puff pastry according to package directions, roll out on floured surface, poke the centre with a fork and score the edges. One pastry sheet makes approximately 6 single mini pastry tarts for individual servings. You can also serve using one puff pastry sheet. After puff pastry is removed from oven; spread the shredded Gruyere cheese. Trim bottoms of asparagus to fit inside of tart. Layer, alternating ends and tips on top of the cheese. Brush with olive oil and season with salt and pepper to taste. Sprinkle a little more cheese and bake until spears are tender, 20-25 minutes. Although, a festive addition at your spring brunch; paired with a scrumptious salad, this makes a satisfying vegetarian main all on its own. PreviousOrange Wine – What is it?